GANDERBAL, FEBRUARY 12: To have first hand appraisal of arrangements and pace of data collection for speedy implementation of the Pradhan Mantri Kisan Samman Nidhi (PM-KSN) Yojana, District Development Commissioner, Dr Piyush Singla today inspected camps being organised at various places in the district in this regard. 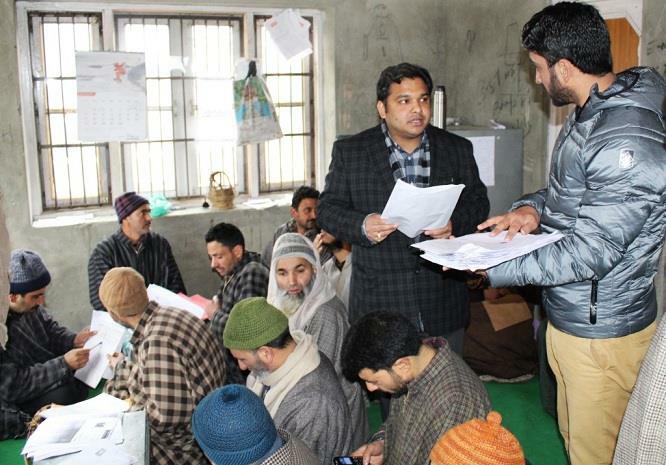 The DDC visited Dubb, Wakura, Watelar, Lar, Manigam and several other camps where he interacted with officials and reviewed the arrangements and pace of data collection for early implementation of PM-KSN. While reviewing the pace of uploading data, the DDC was informed that at several camps power curtailment is hampering the pace of uploading data, to which he directed the concerned Tehsildar to procure invertors and heavy batteries to overcome the problem so that data capturing target is achieved well in stipulated timeframe. He stressed upon the concerned for transparent and speedy identification of the beneficiaries so that the benefit goes to the deserving well in time. He also directed the concerned departments to work with coordination and greater synergy for the better implementation of the scheme. The DDC also directed the concerned officers to work on war footing basis to ensure the completion of desired task viz-a-viz uploading of requisite data of eligible farmers on Portal before February 22, 2019. The DDC instructed the officers to spread awareness about the scheme in their respective areas so that maximum beneficiaries could be registered. The DDC appealed the general public to come forward and enroll themselves with the required information. The beneficiaries can enroll themselves by producing account number, bank IFSC code and Aadhaar /ID card number.